Now that it’s December (What??) I can finally start wearing my holiday uniform. I didn’t think I would be typing those words anytime soon, but I can’t believe it’s the last month of the year already. Mostly because this past weekend was great weather wise – more like spring weather. It will all change from tonight, but at least we have warm thoughts to last us until spring. Now let’s focus on this holiday uniform. For a person who doesn’t really wear red, it seems that my holiday uniform consists of a lot of red. I feel like in the winter time, red pops and you don’t really need to try to hard with the rest of your look. On the other hand, black is definitely my go-to winter color and it’s just classic. You can wear black a million ways. 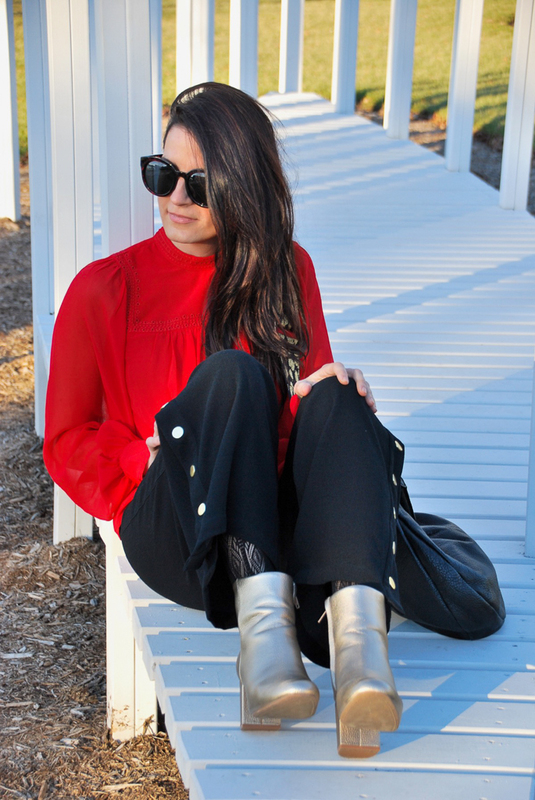 I thought adding gold booties to my look (and closet) were a good idea. They are just so fun to wear and comfortable. And last but not least, I’m really glad that I invested in a guitar strap last year for my handbag (that I’ve had forever) because I didn’t have to buy a whole new bag just because the original strap was very old and distressed. That’s a great way to rotate your older handbags and freshen them up. Those are all my style tips for today. I wish everybody a happy holiday season!